DOES NOT FIT: 2008-10 RZR, see #10108. Fits either a full size 34/78 980 Optima battery or an Odyssey PC925. Includes two different size hold down straps. Mounts with self tapping screws provided. 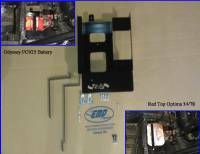 Includes lugs to convert a top post battery to a marine type battery with 5/16" studs on top for your stock battery cables. NOTE: You must cut out the stock plastic battery tray. Now, you can install a full size battery in your RZR. 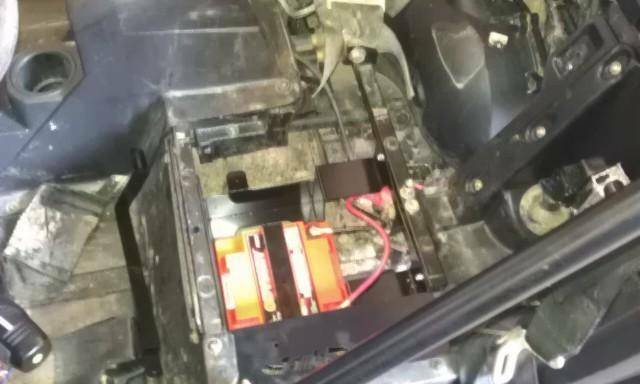 Fits under the drivers seat and replaces the small stock battery. Hold either a full size Optima or an Odyssey PC925 (Length 9-7/8 x Width 7-1/8 x High 6-1/2). Comes with two straps to secure either size battery. Also, comes with lugs to convert a battery lug to a marine type terminal. Pictured with an Optima 34/78-980 Red top and an Odyssey PC925 (battery not included).